Meet new sailor and 20-year U.S. Army veteran Meagan Bryant. 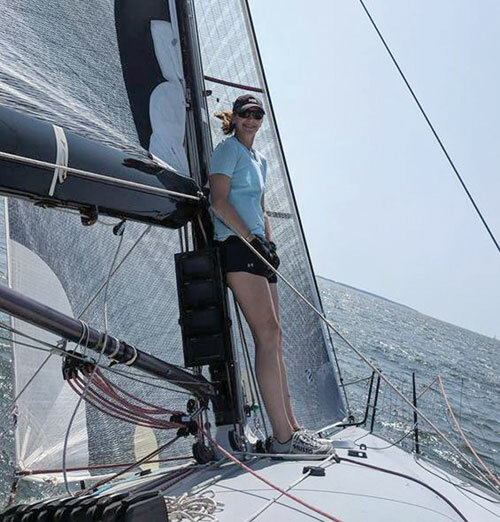 This year Bryant joined the Annapolis sailing community in a big way, and now she has exciting plans for the 2019 season and beyond. My introduction to sailing was in my mid-30s, in Southern California in 2009, where I was invited aboard a Farr 30, Schock 35, and a Ranger 27. For half a racing season, I was ballast and trimmed spinnaker a few times. Fast-forward to 2018, when I reconnected with a high school friend that I had not seen in 26 years. I had spoken with a colleague just the day before about getting back into sailing, when I learned that my friend’s husband directed a veteran’s sailing program called U.S. Patriot Sailing. Within a few weeks they gave me a crew position aboard a Farr 30. I learned some fundamentals, and soon thereafter I began receiving invitations to race with different boats and programs. What should a new sailor expect? Sailing is what a person makes of it, and the frequency is all about the energy you are willing to invest. Speaking from a racing perspective, the sailing community welcomes anyone aboard with a willingness to learn and a positive attitude. Age doesn’t matter, and the ability to put ego aside and be open to direction is crucial. Being able to get past a mistake and stay in the game keeps things running smoothly. It also doesn’t hurt to bring good beer or rum! The majority of people I’ve met in the sailing community have been incredibly friendly and warm. I’ve felt more welcomed here than in any sport I’ve ever been involved in, and I was pleasantly surprised at how willing experienced sailors are to sit with me and talk tactics and offer different ways to get experience. It really is like a big noisy family with the doting moms, the crazy uncles, and siblings that sometimes disagree but love each other anyway. Initially, I pictured sailing as a casual day activity only and was unaware of sailboat racing. I now know that racing can be intense and is a combination of physical and mental stamina. I’m a competitive person and love excitement, so the racing aspect really speaks to me. A pleasant surprise was the craziness that can happen on the start line and at the marks. Who knew sailboats liked getting so up close and personal with each other? Since April, I have been blessed to be invited to race on a Farr 30 and Farr 42, four different J/boat designs, a C&C 34, and Beneteau 36.7. I raced Wednesdays, Thursdays, Fridays, and in almost every local regatta, working pit, main sail trim, and mast a few times. In other words, I spent more time on the water than at my house. Now, I’m on the bow primarily, and I really love playing on the pointy end. Also this year, I attended the Safety at Sea Course at the Naval Academy and the Valhalla Sailing Project Sail Clinic. I’m very excited for the 2019 season. I’ve been invited to be on the bow of the J/30 Blitz as well as the J/100 Flashpoint. Both programs are amazing, and I feel incredibly honored to be a part of them and have the chance to learn from more experienced sailors. I’m eager to be back on J/24s on Thursdays. I plan to work really hard to hone my skills with both symmetrical and asymmetrical platforms and make myself an invaluable crewmember. I plan to take classes this winter, and my bucket list has expanded to include the 2020 Annapolis Bermuda Ocean Race and a transoceanic crossing in the long term. I’ll definitely be going after all the races in between those two events, as well.